management in corn and gives some advice about nitrogen rates in wheat. 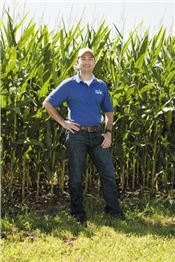 In-season nitrogen management in corn was one of the topics presented by Dr. Josh McGrath, soil management extension specialist at the University of Kentucky. He also gave some advice about tweaking nitrogen rates in wheat. Whether it’s increasing cost of nitrogen fertilizer or decreasing grain prices, it’s really important to be mindful of that efficiency with fertilizer usage. Nitrogen is tricky to manage because it’s so mobile and the nitrogen cycle is so complex. Therefore any tool that can help farmers become better informed and make better decisions with nitrogen applications is going to boost profitability. With increasing scrutiny environmentally on agriculture, water quality, ground and surface water, farmers have to be good stewards; using these tools puts forward a good face for agriculture. McGrath first discussed a nitrogen reference strip. “I think the nitrogen reference strip is critical for in-season management of nitrogen in corn,” he said. “A lot of people say ‘well, I don’t need to manage my nitrogen in season, I can put it all down preplant or fall anhydrous.’ However, that in-season nitrogen makes you smarter. You have 30 or 40 days of knowledge in your back pocket; you know what the weather has been, what the growing conditions have been since you’ve planted that crop and that makes you smarter. So, using a nitrogen reference strip, you can watch how it compares to the rest of the crop that has a normal rate and that strip is going to have excess nitrogen on it. This can be seen visually but some tools are available that are much better than a visual examination. Trimble’s Greenseeker, the AgLeader’s OptRX Sensor, Yara’s N-sensor, are active optical sensors that measure NDVI which is the ratio that involves red and near infrared light. They are active so they put out their own light; it doesn’t matter what the atmospheric conditions are. Trimble has a nice sensor that is small, hand held and inexpensive, and you can sense that reference strip, sense the normal area in the field, collect that data and see how it compares to that reference strip. There are algorithms that many of the land grant universities have put out across the country that have been proven to work very well at providing a nitrogen rate based on those sensors, whether they are hand held, or mounted on a tractor. They vary that nitrogen rate in season. Another tool available for a long time is the leaf chlorophyl meter. Commercially most people know it as the SPAD meter. You clip it on a leaf, it passes light through the leaf, looks at the absorption, and measures chlorophyll content compared to a reference strip. Again, the reference strip is needed, and it helps form a decision on in-season nitrogen rate. Farmers can learn whether a little more or a little less nitrogen is needed to catch up to that reference strip. “For the amount of nitrogen we need, we typically must consider that which comes from the interaction of climate and soil, determining the amount of plant available nitrogen that the soil is going to provide,” McGrath said. “That’s really hard to predict and that in-season knowledge management makes you smarter; you have 40 days of climate, you know at that V4, that V6 rapid growth stage, how much mineral nitrogen the soil pumped to the plant, and that sensor or SPAD meter will help you get that variation across the field. Farmers can learn what they have gotten out of the soil, considering maybe a really warm spring, and determine whether there already is plenty of soil nitrogen. “If, however, it was a little cooler, maybe you need to add a little extra kick,” he added. McGrath also mentioned the in-season nitrate tests for corn, typically called the PSNT pre-sidedress soil nitrate test. McGrath also recommends the corn stalk nitrate test. It’s not an in-season tool, it’s postseason, postmortem. After black layer, after the corn is matured, farmers can get the corn stalks and, according to local university recommendations, determine whether there was too much nitrogen in the system. A lot of phone calls come in questioning nitrogen content in tissue samples at V4, hoping that will help determine the sidedress rate. McGrath said farmers need to be efficient with fertilizer resources.